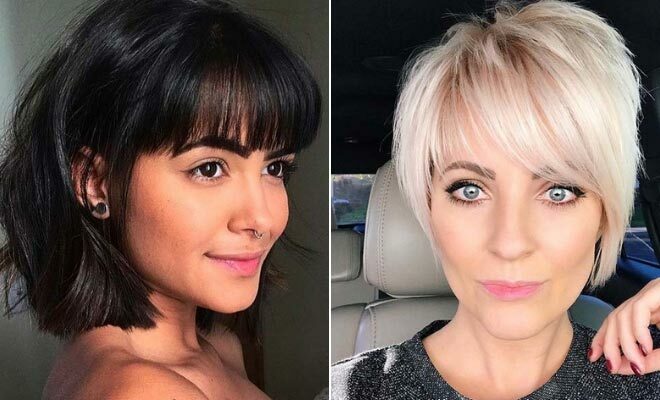 Two of the must-have hair trends are short hair and bangs. So, why not try them both together! This way you will have one super stylish haircut. It is not just us at StayGlam who loves these gorgeous hairstyles, but celebrities do, too! A-listers like Emma Stone, Taylor Swift and Jennifer Lawrence have all been seen with gorgeous short hairdos. To give you some hair inspiration, we have put together 23 ways to wear short hair with bangs. There is a hair idea for everyone, from pixie cuts to bobs. So, take a look and find your new hairstyle! The first hair idea we would like to show you is this bob with bangs. It is a simple, beautiful and chic hairstyle. 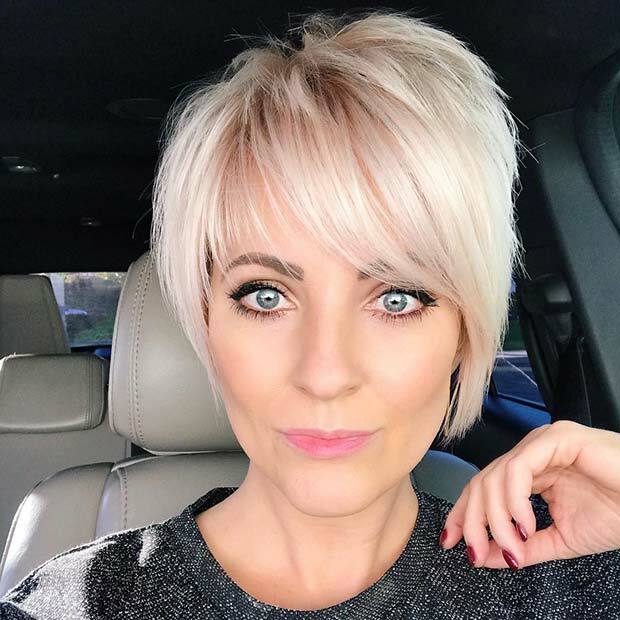 The bob sits just below the chin and has straight across bangs. Hair like this is easy to wear and will suit everyone. A bob will look gorgeous with side swept bangs, too. Looking for a modern and trendy style that will transform your hair? Then this is for you. 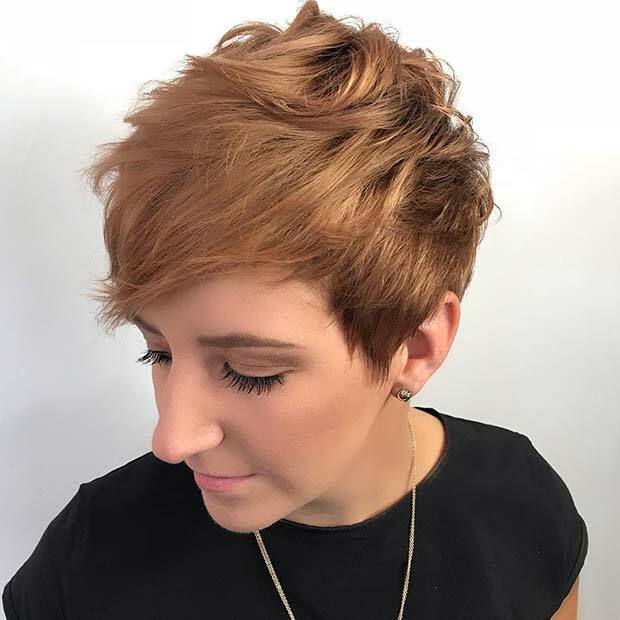 This short hair idea features an edgy undercut and long side swept bangs. An undercut is where the hair is long on the top and the back, while the sides of the hair are shaved. It is a stylish cut in a cool color. You can try a color like featured or have the haircut in a shade of your choice. Next, we have a trendy blonde cut. The hair is a little longer at the front than the back and it has short bangs that are slightly swept to one side. We love the subtle layers as the different lengths give the hair a textured look. It is a gorgeous hair idea and is perfect for the ladies who want a stylish new haircut. Many women worry that they cannot style short hair as much as they can long hair. 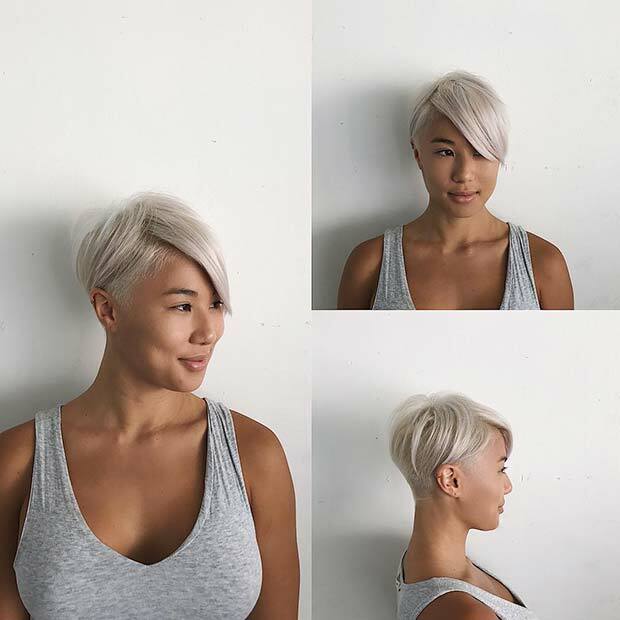 However, you can create some stunning styles with short hair. Here is a beautiful example. 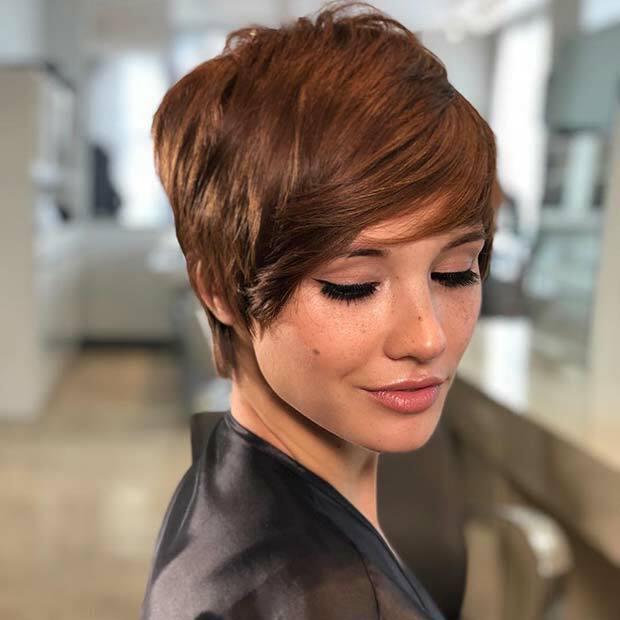 This long pixie cut has been styled with curls. The side swept bangs have been curled, too. As you can see, the curls create a super glam and voluminous hairstyle. Hair like this would be perfect for the days when you want to wow or for a night on the town. 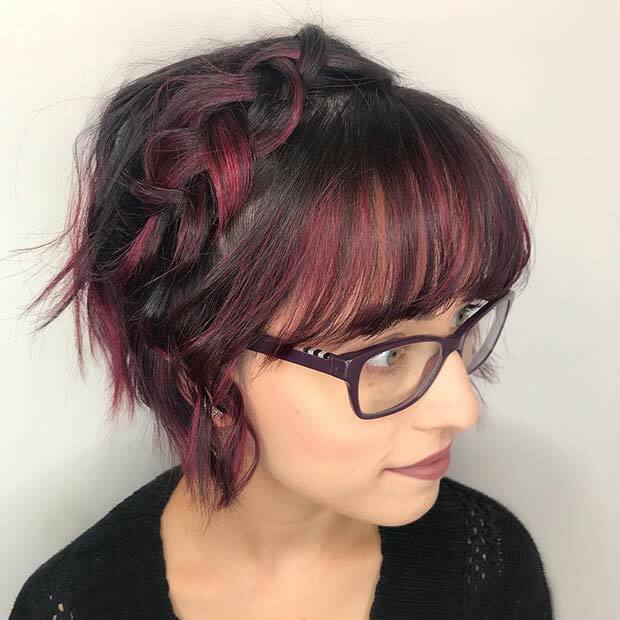 Be bold with hair like this! 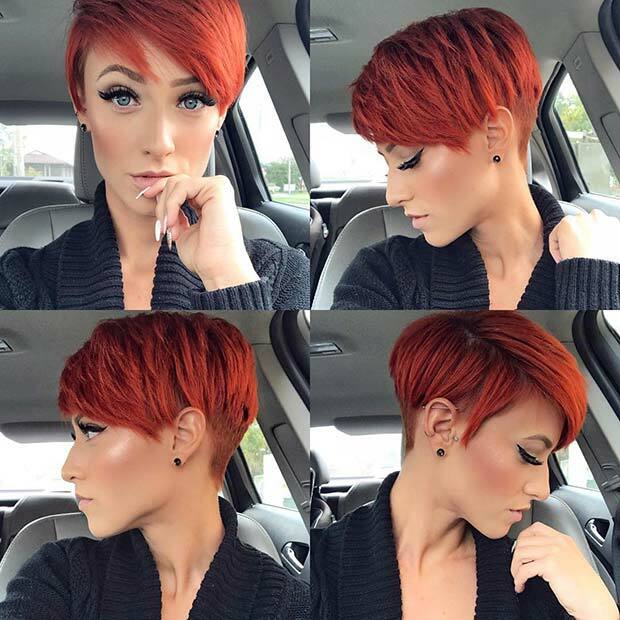 This short haircut is a fiery red shade. The hair is parted down the side and is shaved at the back. There are also long side swept bangs too. A hairstyle like this is trendy, statement making and fierce. You can try and recreate the look with a similar shade or go for a lighter or darker tone. If you want shorter hair but are not ready for the super short cuts then this could be perfect. This hairstyle is a bob and hits just above the chin, there are also side swept bangs too. 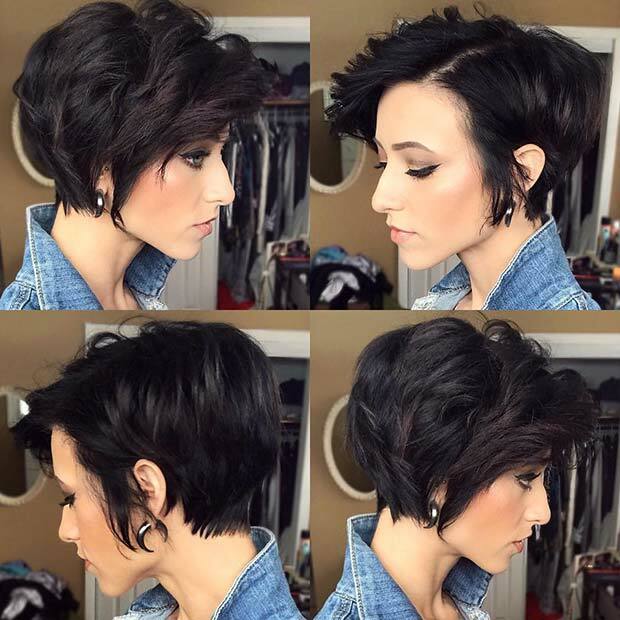 With hair like this you still get that short look but it is not as dramatic as the shaved pixie hairstyles and undercuts. It is a chic and cute hair idea that will suit everyone. Want to update your look for the spring and summer? Then check out this hairstyle. Here we have beautiful short blonde hair that is longer at the front than the back. The hair has a summery vibe because the hair is both blonde and brown. Light blonde just gives the natural brown shade a sun-kissed look. It is a chic hair idea, we love it! Next, we have another bob idea. 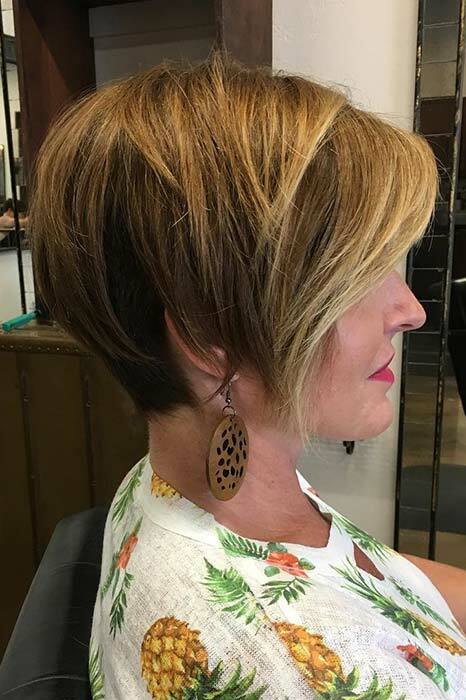 This one features a bob that is chin length with short bangs. These bangs are more like baby bangs because the middle of the bangs is quite short. This is a great style for those that want to try the trend as it is not too much of a dramatic change. You can of course opt for even shorter bangs. 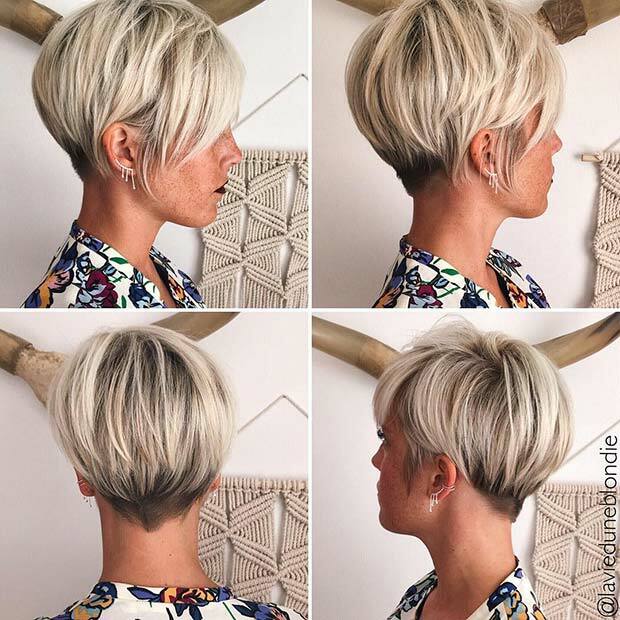 Our next idea is another pixie cut. The hair is short and has long side swept bangs. This is a cute and chic hair idea that will suit everyone. Something like this will be easy to wear and easy to style. The color featured is beautiful too so try a similar color for a complete hair transformation. If you want a trendsetting style, then this is for you. Here we have a short grey cut with bangs. The hair is all quite short and the bangs are straight across. This is another example of how stylish baby bangs can look and to really make a statement, you can make the bangs even shorter. 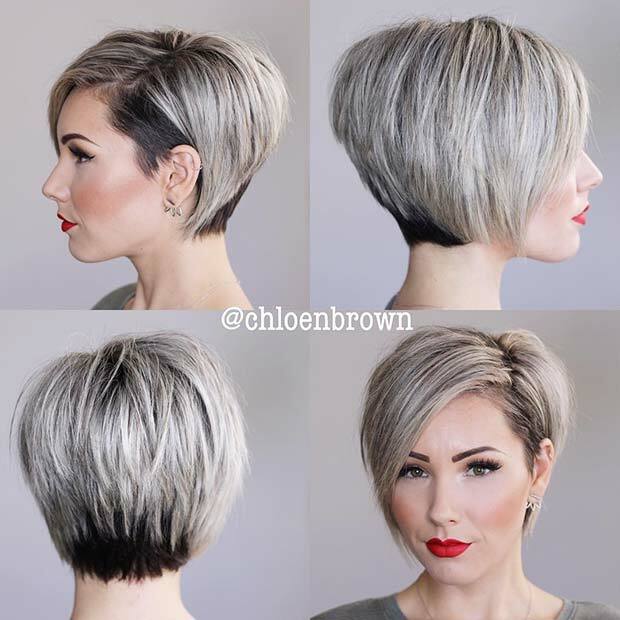 Love the grey, short hairstyles? Then check out this next idea! 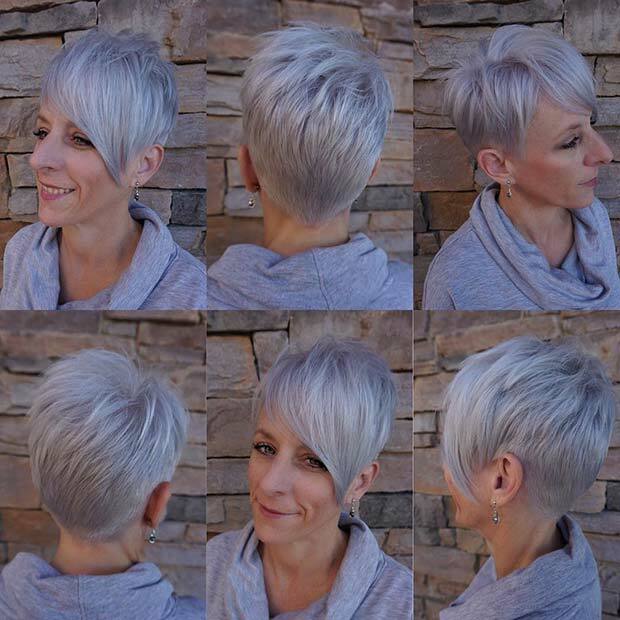 This one has a more silvery tone and the cut is completely different to the grey idea before. The hairstyle here is short at the back and longer at the front with long, side swept bangs. It just shows how awesome grey can look on different styles and shows some of the different shades available. Next, we have another bob idea. The bob featured here is a little longer than some of the ones we have previously shown you. It is a beautiful and easy to wear style with soft bangs. 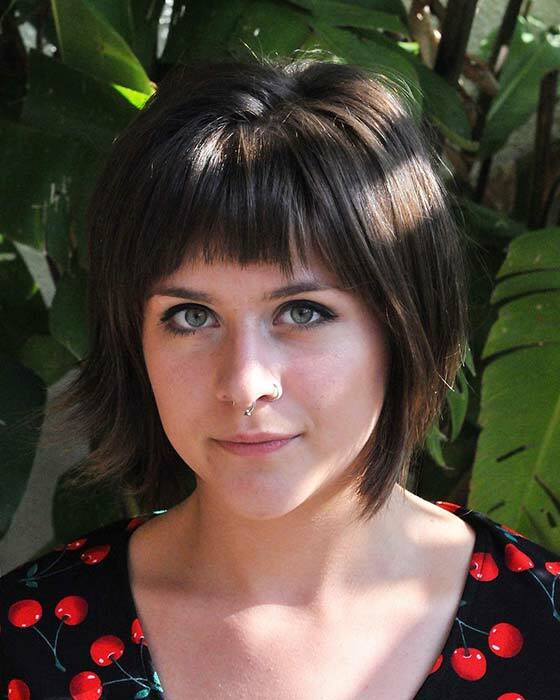 The bangs used on this style don’t have the blunt straight across cut, but are lighter and longer. A hairstyle like this is perfect for the ladies who are trying bangs for the first time and for those who don’t want anything too dramatic. Earlier we featured a stylish red hair idea. Here is another one! This one is not as vibrant as the other red style. The hair here is toned down and is a spicy red shade. It has also been blended with a dark brown which gives it a more natural look. The cut is chic and trendy to with its graduated back and long bangs. This is a stunning style that will suit everyone. Our next idea features a beautiful short cut. The hair is a blend of dark brown and icy blonde with a graduated cut and long side swept bangs. It is such a chic and stylish hair idea. Recreate this look or choose warmer blonde shades. Either way, your hair will look amazing. 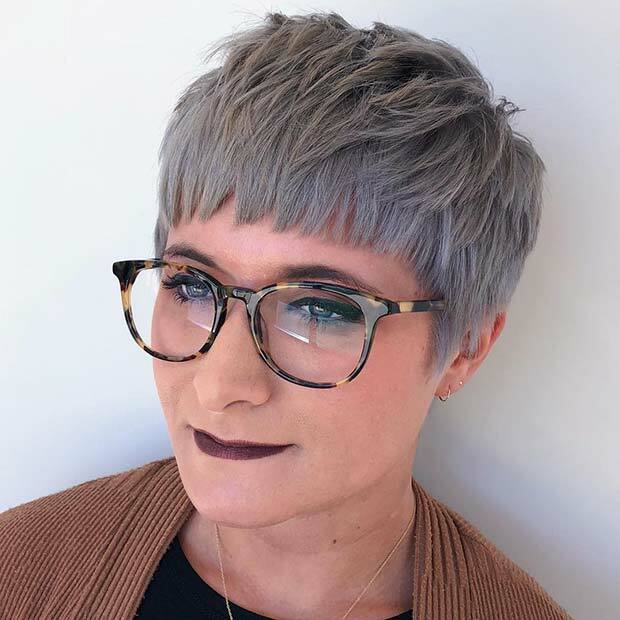 Looking for a fun and cute cut? Then check out this hair idea. The hair is quite short and features long side bangs. 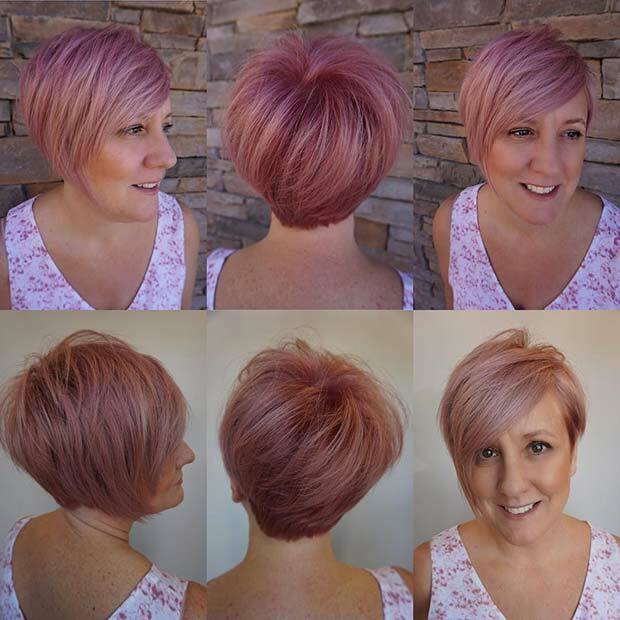 What we really love about this hairstyle is the soft pink color. It is such a pretty and stylish shade of pink. Hair like this would look gorgeous for the spring and summer. Be bold and give it a try! Next, we have a funky and trendy look. Here is a short graduated style with light, straight across bangs. This is a super stylish idea and you can recreate the whole look or just try the cut with a color of your choice. The cute braid is pretty too, so give that a try on your new short hair! There are so many different short cuts available. Here is a trendy one. For this look, the hair is shorter on one side than the other at the front. This difference in length is an asymmetric cut. Asymmetric hairstyles are so stylish and trendy right now. You can choose a subtle cut like this one or go for something more dramatic. This kind of style works perfectly with side swept bangs, too. Prefer subtler hairstyles? Then this is for you. The hair featured here has a chic and short graduated cut with side swept bangs. A hairstyle like this is easy to wear, style and maintain. It is a simple and stylish hair idea that will suit everyone. We love the blonde highlights at the front, they really make the cut stand out even more. Our next idea is another grey style. 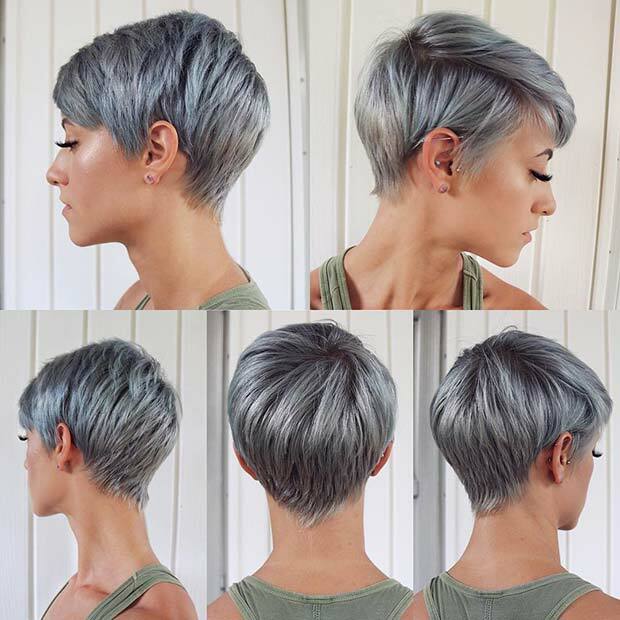 The grey used here is bolder and has a darker silvery tone. 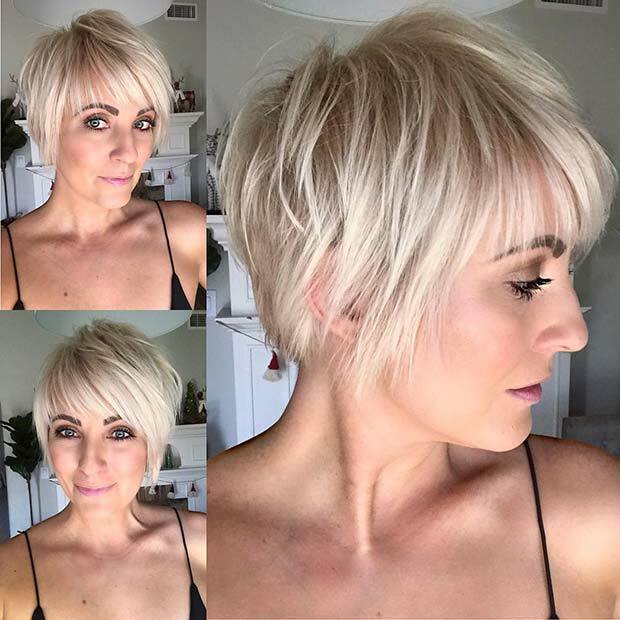 This color compliments the short and simple cut beautifully! Hair like this will require maintenance for the color and cut but the every day styling will be quite easy. It is a trendy hair idea perfect for the ladies who like to stand out from the crowd. Bored of your hair and want to try a style that is edgy and modern? Then choose a haircut like this one! The hair is short and textured with long bangs, while the color is black and light blonde. A black and blonde combo gives the hair a cool and trendy look. 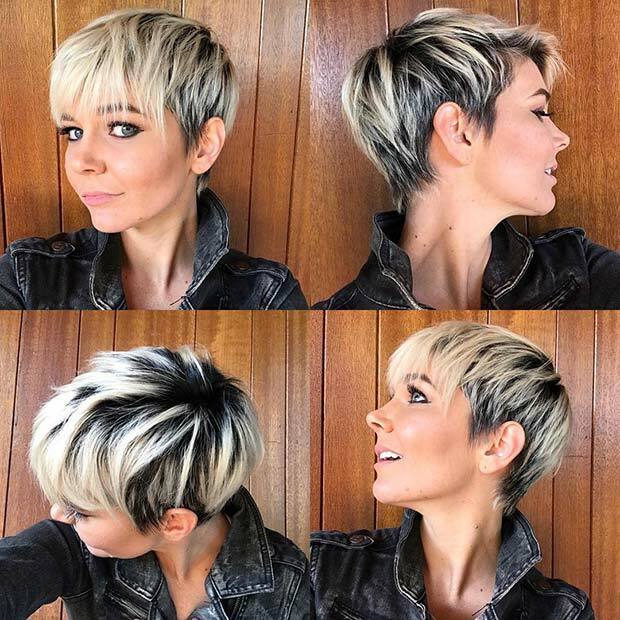 Short hairstyles like this one well let out your inner rock chick! The next style we have to show is this trendy haircut. For this look, the hair is short and it gets longer at the front to create side swept bangs. This is an easy to wear hair idea and we love the stylish color. A hairstyle like this is best suited to side swept bangs instead of straight across. Recreate the whole look or have a similar style in a hair color of your choice. Next, we have a stylish shaved cut. The hair has side part with side bangs and the hair is short and shaved around the sides and back. It is a beautiful, blonde hair idea that will look amazing on everyone. 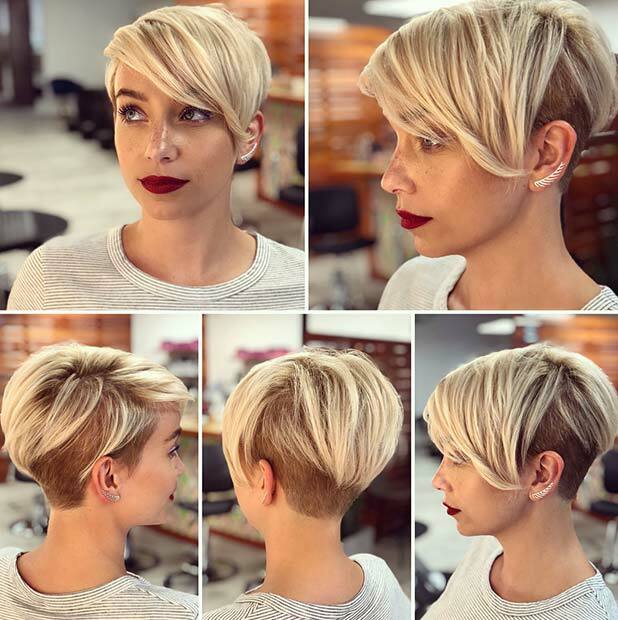 Short hairstyles like these are great for the spring and summer, too. 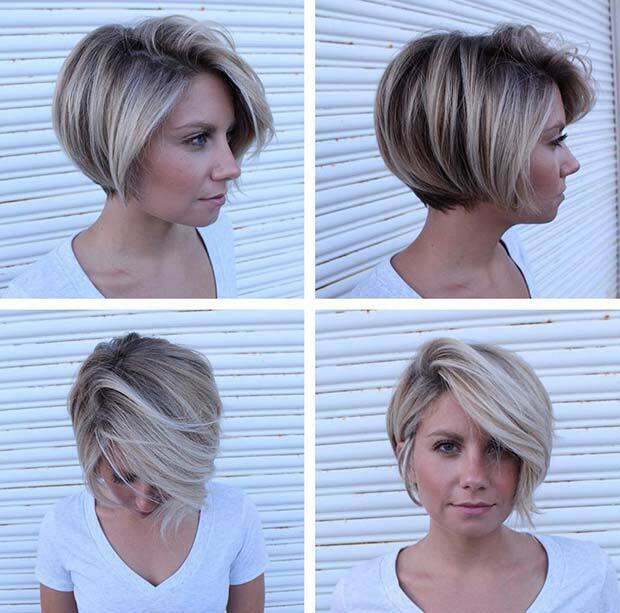 Last on our list of short hairstyles is this trendy short bob. 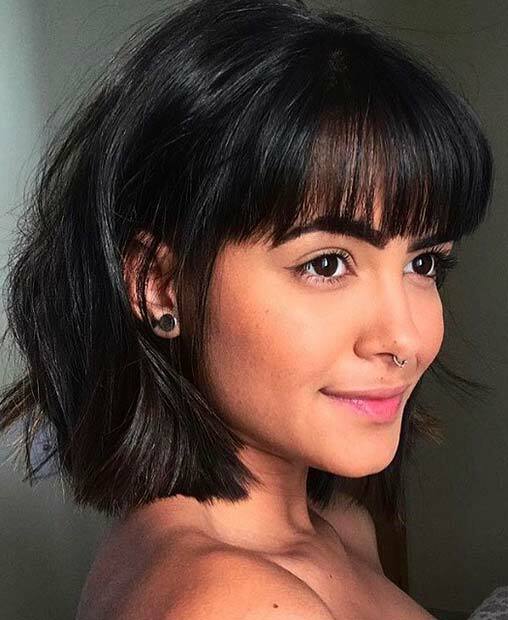 This bob is very short and has long side swept bangs. We love the length of this bob because it is so stylish and modern. 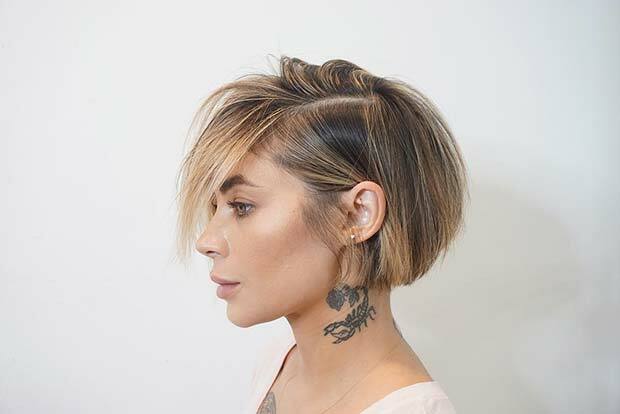 You can recreate this look or choose a similar length bob with straight across bangs. 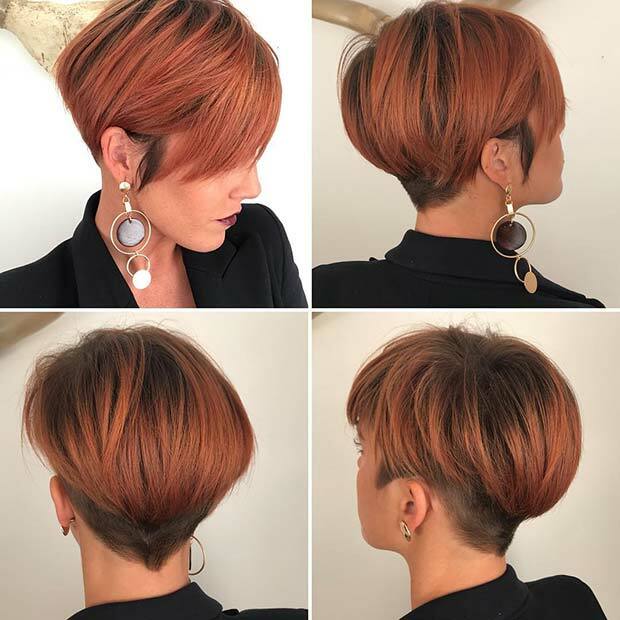 We hope you have found a cool short hairstyle to try! We know we did.